Upon arrival in Oxford, I noticed many cultural features that differed from Canada – some seemed unique to UK culture at large, and others particularly peculiar to the academic ethos of the University. Of the latter are the Ox Sox. 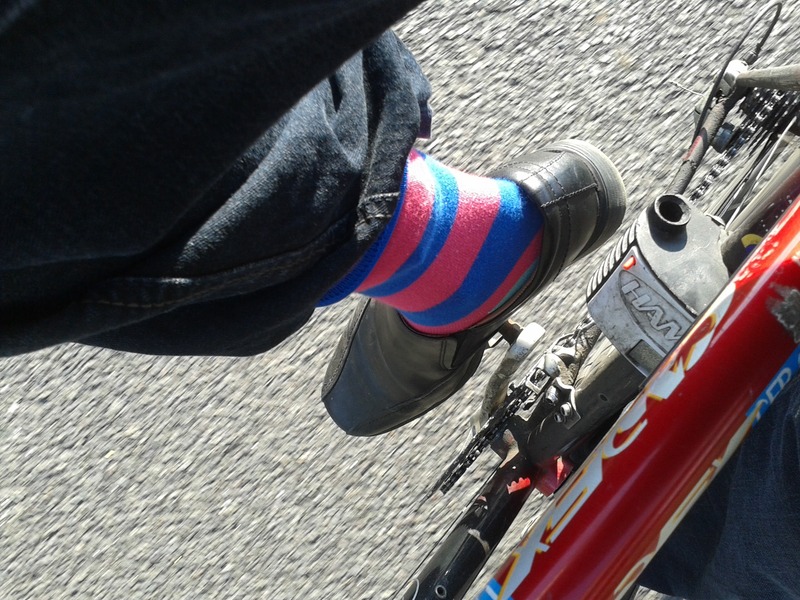 I quickly observed that many highly regarded male academics wore funny multi-coloured socks. How silly, I thought. How un-Canadian. How blinding. How tragic. So I resisted picking up my own pair for the whole of first year. The palette offended my (Canadian) eyes. My Canadian (masculine) identity, though shaken, remained firm and plain. But one fateful morning of second year, while in the department store – all alone, without my wife – I caved to the lure of the Ox Sox displayed there in all their glorious array. So witness the Ox Sox in action, here playing their double role as trouser guard while cycling – with obvious reflective virtue to boot. The cabbies seem to give me an extra span at the sight of them. Why they too are not attracted is now beyond me. The best Ox Sox always double as (nearly reflective) trouser guards. Premise One: My fellow doctoral student is quite bright. Premise Two: The aforementioned fellow is always wearing bright socks at his most luminous moments. Conclusion: If I wear bright socks, I will be quite bright as well, and have luminous moments. As you can see by this rock solid deduction, these studies are instilling massive intellectual traction. Observational and argumentative prowess? Never more astute. Brighter by the day. I invite your comment on the Ox Sox, and my concession to them. Perhaps you want to dispute my identifying these sox as unique to the Ox. Or you logicians may want to name the formal fallacy afoot. Or perhaps you want to affirm the psychological merits of dressing the part? Do you too suffer the allure of the Ox Sox?